Some of our best writers are scientists — a statement that in Hope Jahren's case works just as well in reverse. A geobiologist who heads a research laboratory at the University of Oslo (Norway), Jahren has held a number of prestigious independent research and university positions, received some of the most coveted awards in her field, and worked tirelessly to expose and eliminate the sexism still prevalent in the hard sciences. Lab Girl is a quirky, engrossing memoir that follows Jahren from her first inklings of wonder at the natural world to poking around her father's earth science laboratory at a Minnesota community college to her undergraduate and graduate-school years to a quarter century of field work, teaching, laboratory administration, grant-writing, and (always) more field work. The book features free-standing chapters on various aspects of plant biology, passages that vividly bring across the wonder that comes when contemplating "one of the few things left in the world that people cannot make," the "something green" that means "photosynthesis." Readers will finish this book having learned about soil chemistry, how roots do what they do, why forests grow one kind of tree and not another, how intricate yet simple the planetary breathing only plants can do, and much, much more. They'll learn these things in the best way short of getting dirty: By sharing someone else's excitement at what all but a few of us take for granted. Jahren also writes about her personal life — her struggles with bipolar disorder, how she met and fell in love with her husband, her pregnancy, and, most important to this book and to her work as a scientist, her long, devoted friendship with Bill, a curmudgeonly, foul-mouthed field researcher who moves from appointment to appointment with his academically pedigreed colleague, and who has no patience for bureaucracy, self-pity, shortcuts, a healthy diet, sufficient sleep, or — when he's really onto something — regular hygiene. When Lab Girl is funny, that comedy usually has something to do with Bill. This relationship lies at the core of what the book does especially well, showing us that scientists are human: Mistake-prone, neurotic, driven, imaginative, cruel, funny, tragic creatures who live minute-to-minute, just like the rest of us. Jahren makes it easy to root for these friends because they're hunting the same ground in ways that are sometimes radically distinct. The respect they have for one another is almost tangible. 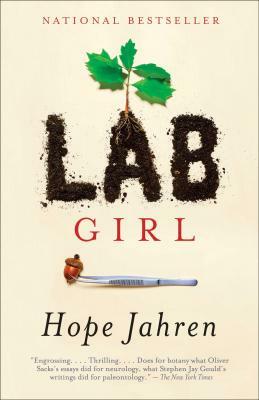 Lab Girl does have flaws, mostly of the too-much-of-a-good-thing kind common in first books: Repetitious dialogue, especially Bill's affection for vulgarity; personification that undercuts some of the authentically amazing science (plants can't "worry" or "decide," for example); and the sudden appearance of crucial information without sufficient integration into the rest of the story (the chapter devoted to Jahren's bipolar diagnosis comes as a nearly complete surprise). Finally, though, these are minor annoyances. For all but a little of its length, Lab Girl is a relief, a reminder, and a revelation. How pleasant to be reminded that the scientific method has nothing to do with opinion, how interpretations must change as soon as observable facts contradict them, how wonderful and necessary curiosity is, and how inexhaustible the lessons of the natural world. In its pages, scientists aren't any more likely than electricians, social workers, lawyers, roofers, chefs, or retail clerks to be the corrupt money-grubbers, elitist killjoys, or pointy-headed scolds that populate the paranoid fantasies infecting whole regions of the public mind. To paraphrase the cliché: Scientists are people, too. John Repp teaches writing at Edinboro University, where no ivory towers can be found.